Yesterday, I attended Vima gourmet food blog awards competition ceremony. Would I win it? Would I not? I had no clue. On my way to Technopolis, I was trying to tame my hair from unruly winds that were sweeping through Athens. I soon settled in, nibbling on lovely food, glass of wine at hand socialising with 32 wonderful bloggers. A great opportunity to finaly meet people I have been chatting to in flesh and bone. We don’t exist only on the internet you know, we are pretty much real. And what did I take home? 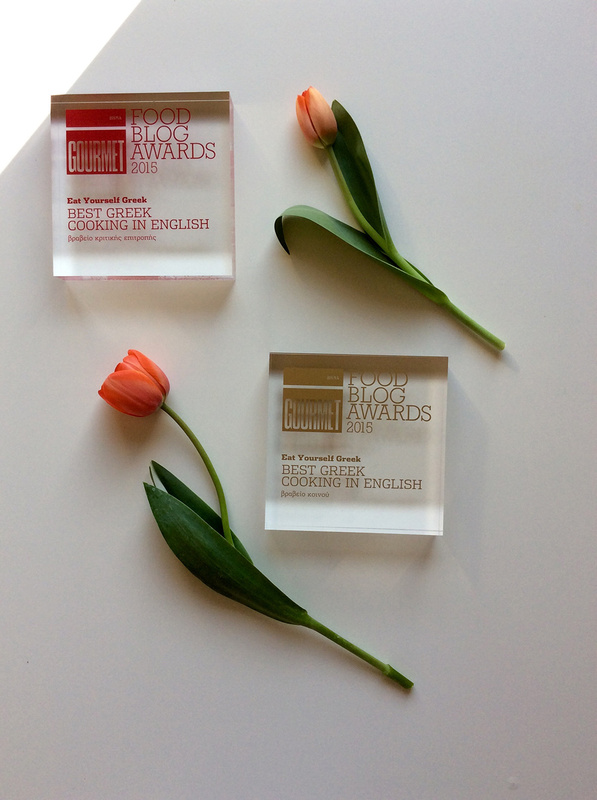 An award from my fans and an award from the critics panel for the recipes. I have been inundated with messages since yesterday, filled with love and kind words from near and far. There are many people who would have liked to be close by but circumstances don’t always allow, so thanks are in order. Eat yourself Greek for me is an adventure, a transition from the UK to Greece that has unfolded over 1 and a half years. With good moments and bad moments, awkward moments and extremely fun moments. Many thanks to the people who were close by when Eat yourself Greek was nothing but a figment of my imagination, stood by me, encouraged me and helped me take a leap that back then seemed like a jump into the void. Many thanks to the people who were on the other side, and everyone in their own way put up a little light to form a runway for me, help me have a safe landing. Many, many thanks to everyone along the way who stopped by the blog, even if briefly, just to say hi and filled the void with colour. I know many of you have been browsing at pictures, drooling over them and then getting a takeaway because you run out time and the grocers were shut. Many of you have cooked the recipes, enjoyed them with your family and passed them on to friends to enjoy. Huge thanks to every single one who took the time to vote and followed the competition over the past 4 months. This award belongs to you as much as me. Last but not least, many thanks to the extremely talented team of Vima gourmet magazine for organising the first food blog competition in Greece, giving the bloggers voice, allowing us to showcase our work through challenges. Many thanks to their photographers who took a look at our snaps, the test kitchen who tried out our recipes, every single person who put in an extra effort so that we had an amasing party at Technopolis Athens yesterday. Many thanks for choosing Eat Yourself Greek for the Best Greek Cooking in English award, it’s extremely rewarding seeing your efforts recognised. I promise to keep it up, keep cooking seasonal, keep shooting minimal, keep the Greek home cooked recipes online and keep sharing moments of my beloved Athens. Congrats!! You really deserve the awards. I am sure your competition was also great! Keep on writing and sharing all the great recipes. Congratulations Eugenia! I’m very happy for you! You made a great job!